Good morning. He just asked me for fshp on fb and is calling himself Morgan Williams. His pic is attached. 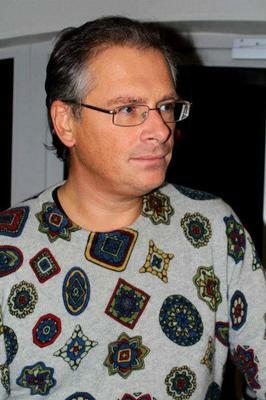 I put on google this morning and it came out related to Alexey Germanovich Lushnikov a Russian painter, television host, writer, producer, documentary filmmaker, political scientist, journalist, and actor. Gonna block him. Calls himself Alex Cook, Randy William Runfelt, Gareth Buchanan, and Jim Rollins too. This man followed me on Twitter, not sure if he contacted me or not. When I saw his picture on a scammer site I turned him into Twitter. I was contacted by an unknown man on Facebook and became suspicious. I did a reverse photo googling and found this page. The Facebook profile is Arnold Roddrick / John Zlim. It appears to be a new account and the majority of the friends appear to be from Nigeria. He's been talking to me and was madly in love with me on the second day. He said his wife died of cancer 3 years ago and his son 14 years old is in boarding school in West Africa!! The funny part is I've been playing along as I knew it was too far fetched to be true. He also is a oil rig engineer and works for transocean a huge company! I've asked a lot of questions and when he can't answer he just doesn't reply for ages, then comes back on saying bad connection. I'm about to send a pic of this to him now that I found him as Morgan Williams. Hallo! I have received this mans pic yesterday but under another name of Samuel Barker. The Pic related to Alexey Germanovich Lushnikov a Russian painter, television host, writer, producer, documentary filmmaker, political scientist, journalist, and actor. He claims himself to speak italian. Thank you for sharing. The more pictures we can share, the better.